Sophomore defenseman John Quigley defends the puck against West Chester University defenseman Jeff Dugan during the Rams’ 6-4 victory over the Dragons Oct. 26 at the Class of 1923 arena. Quigley has tallied two goals and two assists for Drexel this season. It didn’t take much thought for Drexel club ice hockey captain Andrew MacBride to express the relationship between his Dragons and their opponent, West Chester University. Really, the words themselves weren’t necessary — although it did bring a smirk to his face to actually say it — because the Rams and Dragons had just shown their disdain for each other through 60 minutes of heated play Oct. 26 at the Class of 1923 Arena, which ultimately ended with a 6-4 West Chester win. “Physical” wouldn’t begin to describe it. Neither would “chippy,” as that would still be a bit too understated. “Bloodthirsty,” perhaps, would probably be the best fit. The game featured more penalties than you could count on your fingers and toes. However, most of the penalties came from aggressive, hard-nosed play rather than from dirty hits or cheap shots. It was obvious that Drexel and West Chester wanted the win more than anything and were trying, for the most part, to avoid putting each other on the power play. 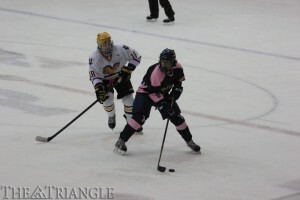 The power play is where the Rams really won the game, as they scored three goals with the man advantage, compared to only one for the Dragons. At even strength, the Dragons thoroughly dictated play of the game. Overall, Drexel outshot West Chester 44-25, including jumping out to a 27-10 lead in shots near the beginning of the second period. But despite this advantage, Rams goaltender Michael Rice kept the puck out of the net, and his team jumped out to a 3-0 lead. The Dragons finally got on the board when sophomore defenseman Zach Paro sniped the first goal of his college career, following with a spectacular hand-waving-like-a-goal-siren celebration while being mobbed by his teammates. The teams each scored two more goals to conclude the second period, which ended with West Chester on top 5-3. Drexel’s goals came from sophomore forward Nick Lombardi on a deflection from behind the net and junior forward Marco Gagliardi, who deposited a shot from about 20 feet following a rebound. 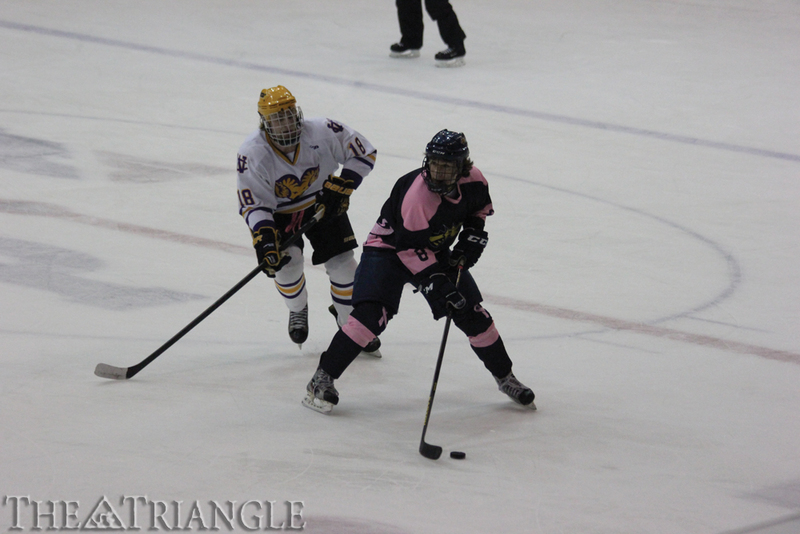 Sophomore forward Matt Williams scored a power-play goal early in the third period to cut the deficit to one, but the Dragons could get no closer. With sophomore goaltender Zach Kantner pulled in the game’s final minute, a Drexel defender broke his stick on a one-timer attempt, and the Rams flicked a long shot into the empty net to clinch the win. The game came as the second in a home-and-home series, with Drexel defeating the Rams in West Chester the night before by a score of 3-2. The Dragons were ecstatic going into the game, not only because they had the chance for a sweep but also because it was a special night for the team. Each season, the Drexel senior class chooses a charity to support and raise money for through cooperation with the team. This year, MacBride and others chose Twin Peaks Cancer Foundation — specifically for breast cancer research — and “Pink In The Rink” was born. The Dragons sported navy blue home jerseys accented with pink numbers, sleeves, shoulders and waistbands, with a pink breast cancer ribbon below the fire-breathing logo. Before the game, Drexel presented a $3,000 check to Twin Peaks, money that the team raised for the event. Following the obligatory postgame handshakes between the two teams, the Dragons gathered together at center ice to take a team photo with their pink garb. Although it was for a good cause, you would be hard-pressed to find more than a handful of the players smiling — understandably so following a tough loss to their huge rivals. His sentiments were absolutely backed up by Drexel’s play on the ice. Every shift, every jump over the boards was 100 percent effort from all 20 guys on the roster. The happiness showed, like Paro’s exuberant celebration. The excitement showed, like the bench’s reaction following every big hit. The emotion showed, like the many stick smashes on the boards following West Chester goals. And the frustration was heard, like the F-bombs from the players that were occasionally audible enough for fans in the intimate building to hear. The Dragons’ next home game at the Class of 1923 Arena is Nov. 9 against Lehigh University at 7:45 p.m. Give these guys a shot, because even though it isn’t the caliber of play that you might see at a Philadelphia Flyers game, you will surely appreciate the sheer desire shown on the ice. Even though “Pink In The Rink” night is over, maybe it meant more for this hardworking team than raising money for a good cause. It was appropriate that the Dragons sported pink on their jerseys, because this team surely wears its heart on its sleeves.